It would have made a very nice narrative. That there is a prodromal phase for Alzheimer’s disease, perhaps called mild cognitive impairment, at which point you could ‘stop dementia’ in its tracks. And anyway you would have identified individuals a long time ahead of that, with personal genomics for example. It all started fairly innocuously. Except, it’s clearly ridiculous to scan everybody in the population in the off chance that some of them are surrepticiously developing Alzheimer’s disease. It’s also relatively impractical to stick a needle to the lumbar spine, if not contraindicated, of possible individuals. The results for cerebrospinal fluid biomarkers, brain atrophy on brain scans, and so are are desperately unsuitable for the clinic. And it was clear from the audience of the #SDCRN that some people were not playing ball either. But earlier in the day I’d laid into Prof John Starr had somehow collapsed the whole of living well with dementia into “non-pharmacological interventions”. But as a Cambridge graduate himself, Prof Starr was a real delight to talk with over coffee; as a Chair in Edinburgh, he knows well some of my friends, and indeed knows Prof John Hodges who kindly wrote my Foreword. We had a lovely chat anyway, and I decided we’d been talking at cross-purposes. Anyway my political activism, somewhat crankily on behalf of people actually living with dementia, continued as the day progressed. Indeed, today’s #SDCRN conference, the fourth annual of its kind, for the SCDRN, gave Henry Simmons, CEO of Alzheimer Scotland (@AlzScot), a chance to recapitulate on the importance of the G8 Dementia Summit, held last year in London in 2013. 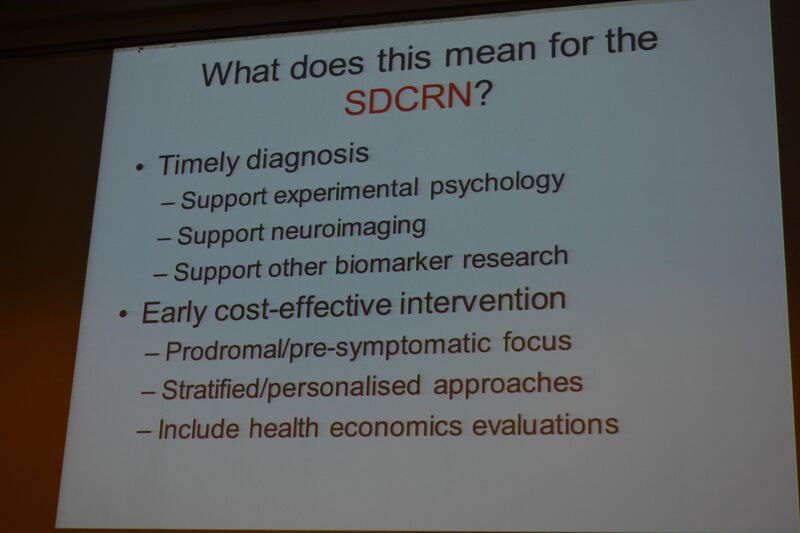 This meeting was being held at the Beardmore Conference Centre, near Glasgow; so this perspective was entirely fair, given that Alzheimer Scotland have been powerful supporters of the #SDCRN. Simmons explained how the Summit had stablished steering group with respective G8 organisations, Alzheimer’s Disease International and Alzheimer Europe. However, after 50 years of campaigning, did Simmons feel that this was as a particularly good outcome? No. Simmons remarked upon how there were somehow 88000 people involved with people living with dementia in Scotland, including carers and families. I mooted over the lunch break with Dr Peter Connolly, Co-director of #SDCRN, that at least carers of people with dementia at least now ‘had a voice’. Connolly said that “they had always had a voice”. Immediately, one can think of Thomas Whitelaw (@TommyNTour) with his turbo-charged mission to give carers a voice in Scotland. It’s slightly out of focus, but bear with us. Simon Denegri, @SDenegri, had earlier in the day given an outstanding talk on the need for patient involvement in influencing research policy in dementia. Simon is the Chair of INVOLVE. He is also the National Institute for Health Research (NIHR) National Director for Public Participation and Engagement in Research. Denegri, interestingly, welcomed the appoint of Prof Martin Rossor (@martinrossor) as the Dementia Tsar for research (announcement here). I thought the substance and tone of this talk was spot on, though perhaps I would prefer to think of individuals as persons who happen to be living with a diagnosis of dementia who can become ‘patients’ within the jurisdiction of the medical profession at any time. Simmons was blunt about the fundamental problem: that it currently takes $1 billion to take a drug to market, and there’s only a handful of drugs with limited efficacy for symptomatic treatment. Simmons’ concession that “But we’re weak at then seeing what works” I took as a fundamental concession to the idea that we also need good quality research for care too, in keeping indeed with Simon Denegri’s reference to ‘cure, care and cause‘, extended by Jess Smith (@smiththegeek), Research Communications Officer of the Alzheimer’s Society, to include ‘prevention‘. Simmons though put it slightly more strongly, emphasising that it would be inappropriate to focus on research on cure without giving due regard to people living with, and caring for people living with, dementia. And this was a theme which Dr Peter Connolly reverted to in his summary of the whole day – that it would be now impossible to separate out the importance of any one view: cure, care, cause and prevention. The way that Connolly proposed the issue in his summary, I thought, was an effective one: that one could never dream to imagine research strategies in cancer having disproportionate areas of focus in care, cure, prevention and cause. Clearly the news of Scotland is good, and Simmons is proud that progress has been made. 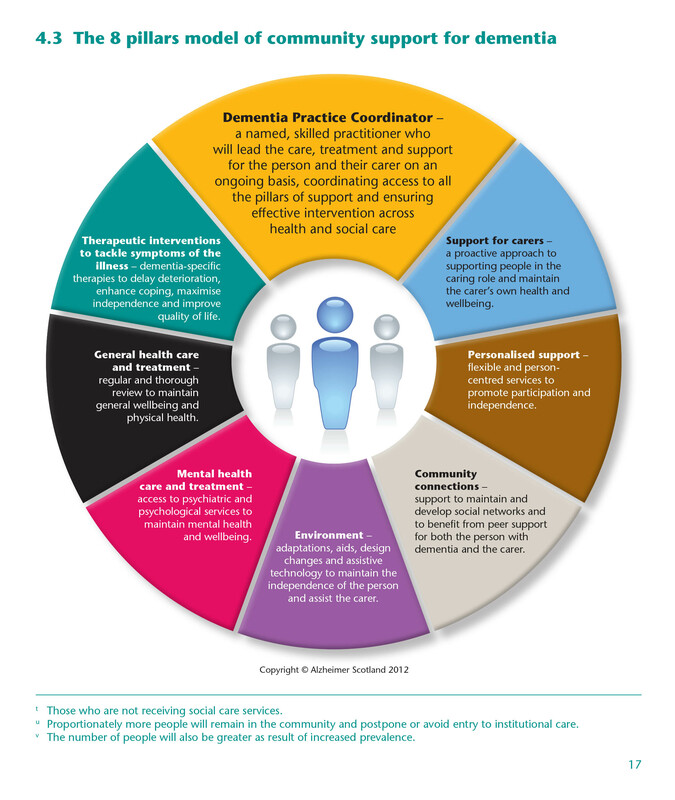 There is a National Dementia Strategy in Scotland from 2013-6. In this, there is a guarantee of a minimum of one year’s post diagnostic support, from a named link worker, for every person diagnosed with dementia. The guarantee is based on the five-pillar model developed by Alzheimer Scotland. This clearly has implications for the organisation of the integration of health and social care for England, with formulations of ‘whole person care’ edging towards a similar system with these key coordinators. For example, Serco puts quite a bit of emphasis already on a ‘care coordination centre’. Amongst the five key challenges for Scotland, fear of dementia is mentioned as a reason for people not seeking diagnosis. Stigma is mentioned and the reluctance of some general practitioners to diagnose. Solutions are described in the form of informing people of the benefits of diagnosis and improving the quality and availability of post-diagnostic support. I think the audience generally felt we needed to talk openly about stigma, and Dr Peter Gordon (@PeterDLROW) cast the net wider to say that we ought to be careful about language full stop. but I met a guy called Hugh whose late wife had been living with dementia for eight years. He was passionate about being a ‘Dementia Friend’, and was indeed extremely proud of the work being done in his community. There were many aspects of Simmons’ speech which reflected my overwhelming philosophy of ‘Living well with dementia’, on which I have written a whole book recently, evaluating critically the underlying evidence base for this jurisdiction – but in a suitable manner for an interested and informed member of the general public. Simmons at that point raised a point that no-one can fundamentally can disagree with the fact people with dementia need information to be able to exert choice and control, or to live in supportive communities. I agree with Simmons, as indeed I have devoted two whole chapters to these policy planks in my book. Simmons also described the correct view, in my view, that persons with dementia need to be engaged with the system far before a “crisis” occurs. The evidence appears to suggest that it might be possible to prevent unnecessary hospital admissions of people living with dementia. This is definitely a phenomenon which we have been experiencing too in acute medicine in England (with a large proportion of the acute medical take having a comorbidity of dementia). 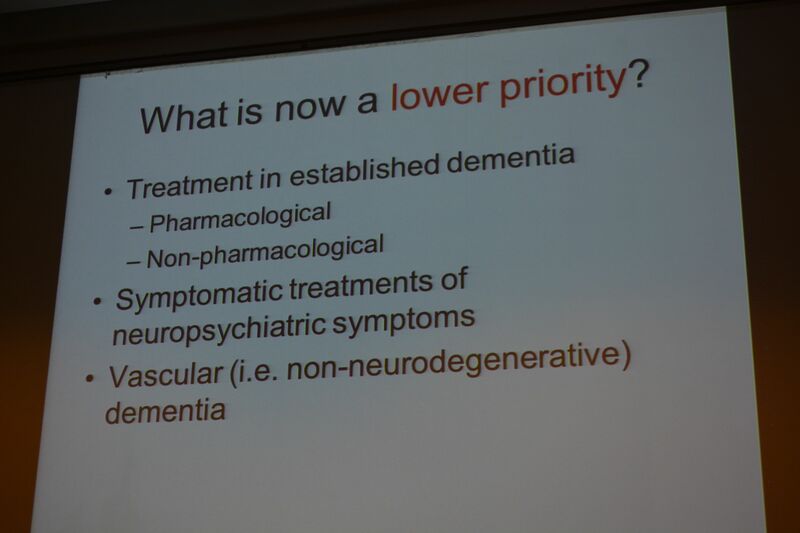 But Simmons also warned, correctly, that, as the persons’ needs for living well with dementia changes, we need to make sure that their solutions for living well adapt. Simmons then put a slide which interested me, as it fundamentally reflects the ethos of my book, of persons interacting with their environment. I still have concerns about the word ‘care’ as it implies some sort of transaction potentially, and I prefer the notion of ‘shared care’ of people with dementia being at the heart of decisions when they legally have the capacity to do so. Simmons made quite a big thrust of his thesis that we need highly quality research to inform on integrated care (between health and social care systems), and implied that the current systems were a long way from that. It is likely an incoming government both in England and in Scotland will be publicly opposed to social cuts, whilst carrying them out in some form, while promoting personalised care (and possibly personal budgets). But Simmons view that there needs to be good quality researching care is borne out by other stakeholders too, and, despite the stated aims of the G8 dementia Summit, a collective opinion may be slowly crystallising. You see, under this system and “whole person care” which will be left for a future UK Labour government to introduce, I view the person with dementia always to have the philosophy of ‘living well’ right behind them – and they truly become a patient when they fall ill, and then become under the jurisdiction of the medical profession which I think still has much to learn about the dementias.